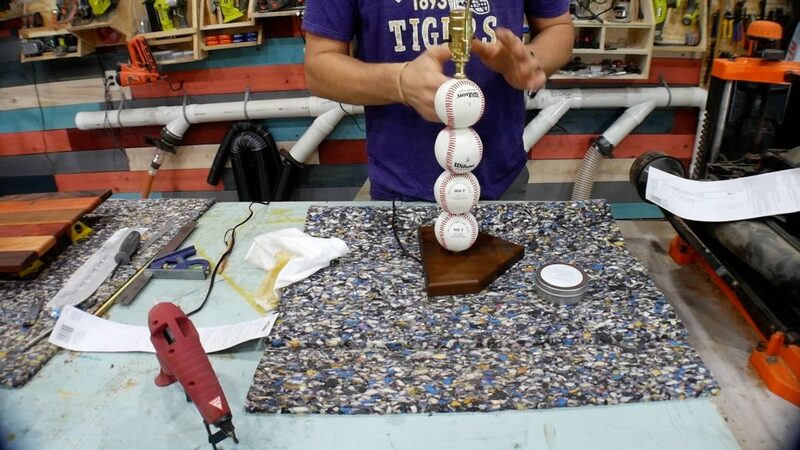 In this tutorial, I show you how to make a DIY baseball lamp. I’m a baseball coach so I had plenty of these laying around. Any shade will do – I used the one I from the original lamp. 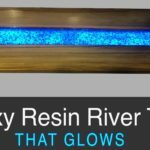 I used a piece of scrap IPE in my shop. The weather is warming up here in South Louisiana (actually, it barely cooled down at all this winter), Mardi Gras is in full swing, and daylight savings time is around the corner. Most importantly, it’s Baseball season! 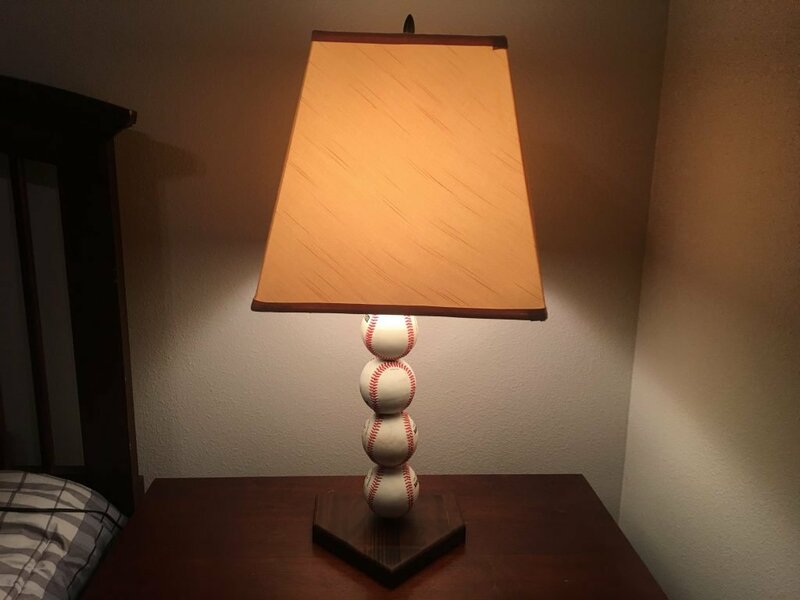 My family and I love the game of baseball, so I decided to build my son a DIY Baseball Lamp. 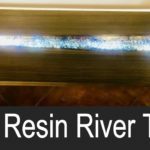 Be sure to visit my other baseball projects like my wood and resin baseball rack or my baseball bat rack DIY plans. 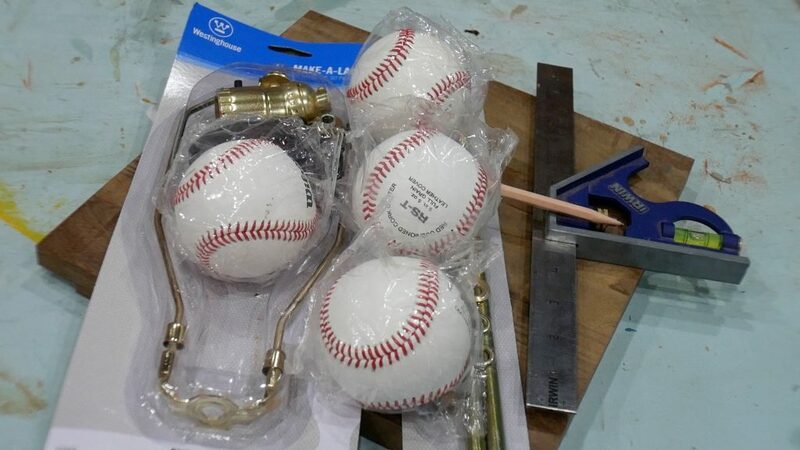 In order to start successfully, verify you have all the materials you need for the diy baseball lamp before you get started. Ultimately, It is quite frustrating to start a project and realize you don’t have the materials you need – trust me, I do it all the time. 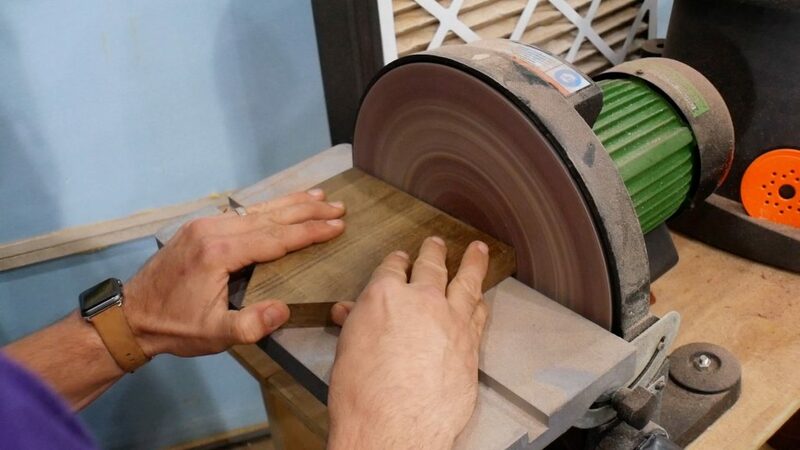 First, find or cut any piece of wood that is 8″ x 8″ square to be the base of the diy baseball lamp (home plate). Luckily, I had a piece of IPE laying around my shop from a previous project that was 9″ x 9″. 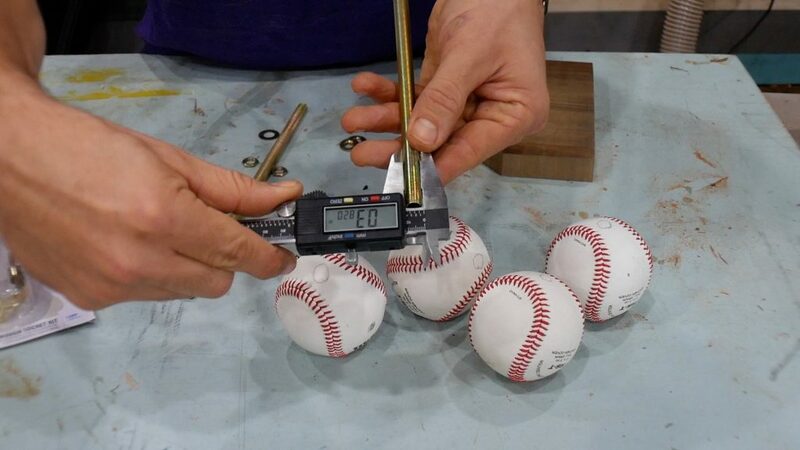 Essentially, you can change the size of home plate as long as you follow these measurement guidelines: Back of home plate = x. Each side of home plate = x / 2. The 2 remaining sides are set at a 45 degree angle until they intersect. 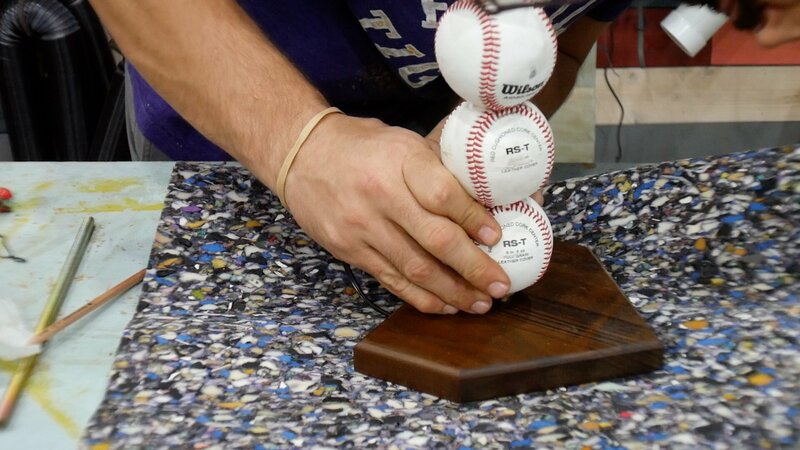 Furthermore, the standard size of home plate is 17″ (Back) x 8.5″ (straight side) x 12″ (angled sides). 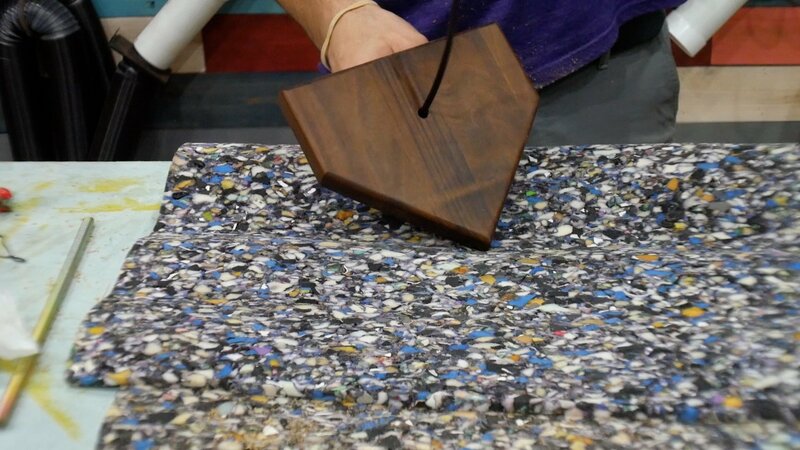 First, trace home plate on your chosen piece of material with a pencil and a combination square. I chose a scrap piece of IPE. 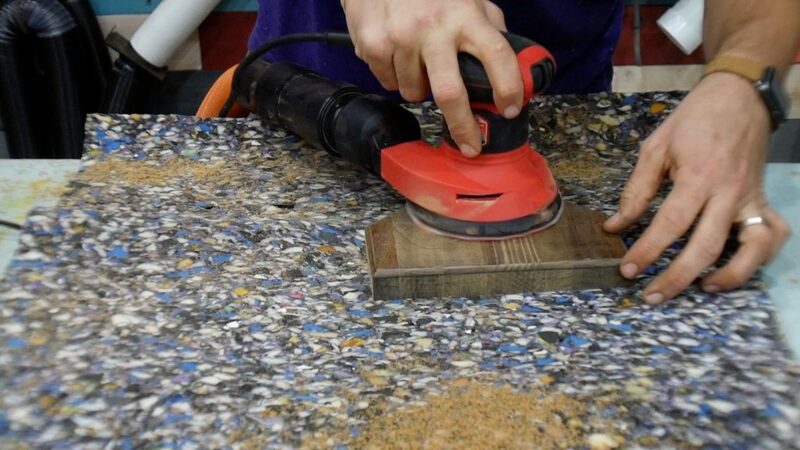 Next, cut out the plate with a jigsaw or bandsaw. 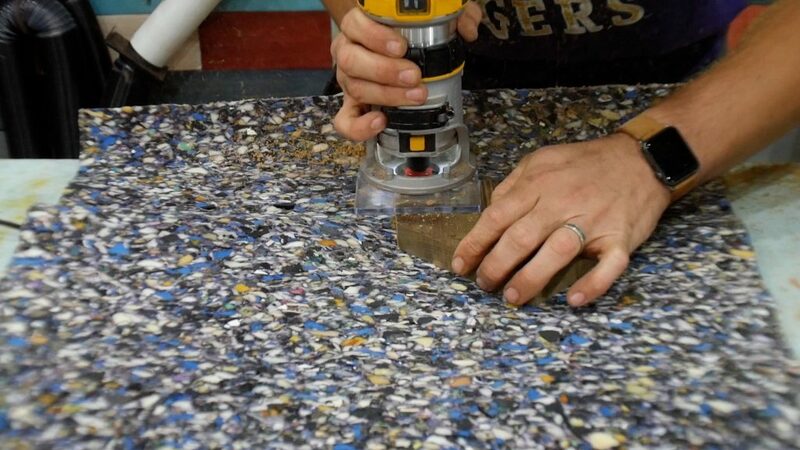 Remember to always cut outside the lines and trim the remaining material off with a sander. First, trim remaining material using a sander. I used a disc sander, but an orbital sander would work as well. 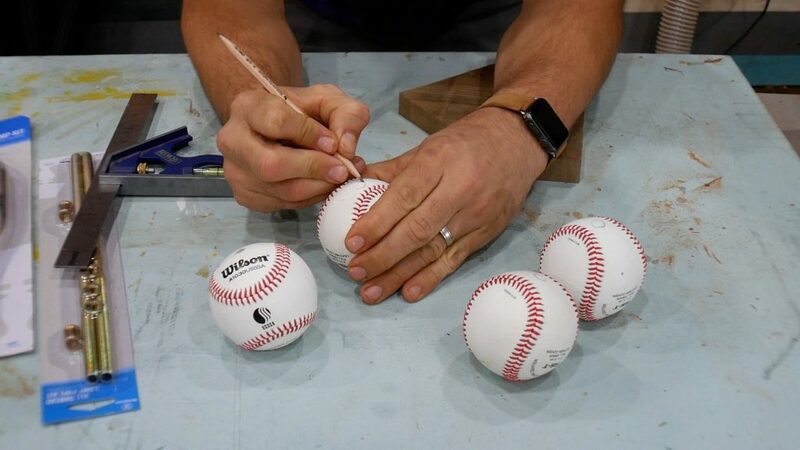 First, make a mark on the baseballs in the same general area with a pencil. 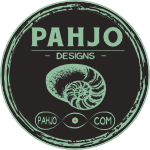 I chose an area on the ball that would minimize the logo/emblem once stacked on each other. 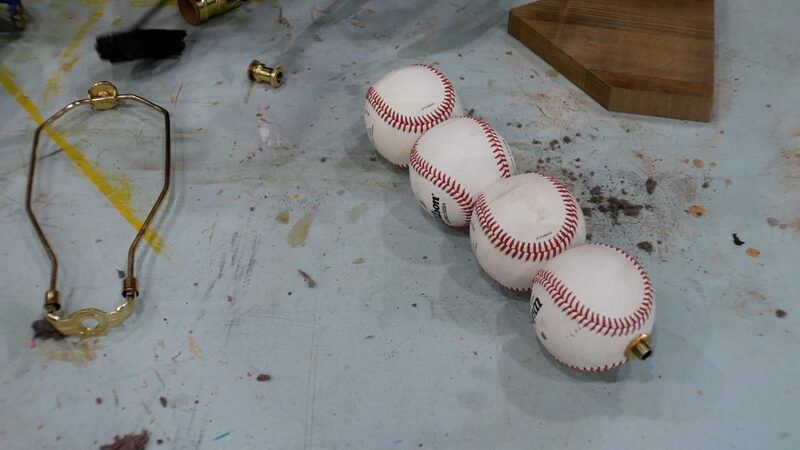 Also, I chose 4 baseballs because they fit on the threaded rod perfectly with about a half inch of thread remaining on each side. First, use a digital caliper, regular caliper, or any measuring device to measure the width of the threaded rod. As you can see from the picture, the rod one is 3/8″. 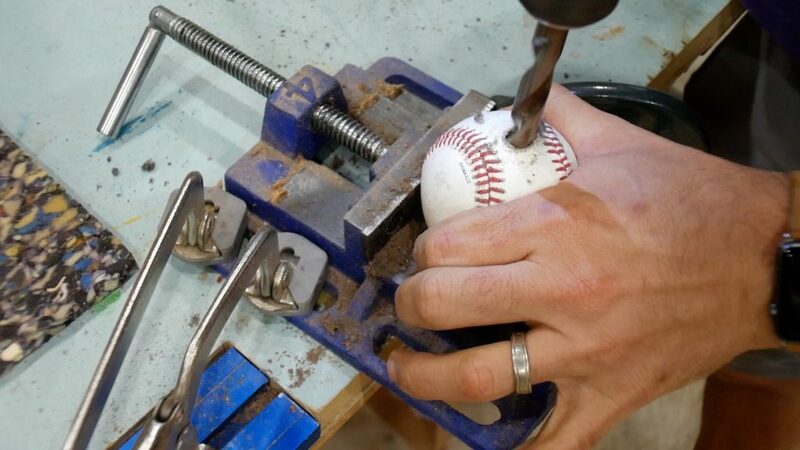 First, secure the ball with clamps or a vise. Next, drill a hole on the mark with the same size drill bit as the width of the rod. Essentially, This hole will be a bit too small for the rod. However, it is better to have it too narrow rather than too wide. The holes I drilled were too small for the rod to fit, so I stepped up to a 1/2″ bit. 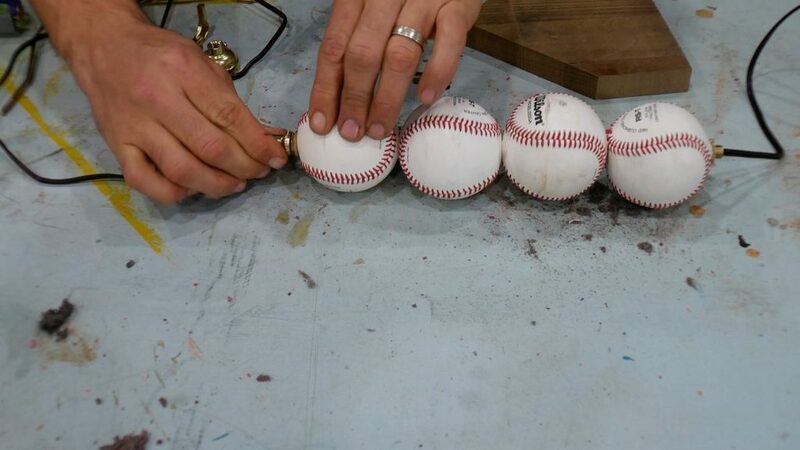 First, place the baseballs on the threaded rod and secure them in place with the lock nuts/washers that came with the lamp kit. 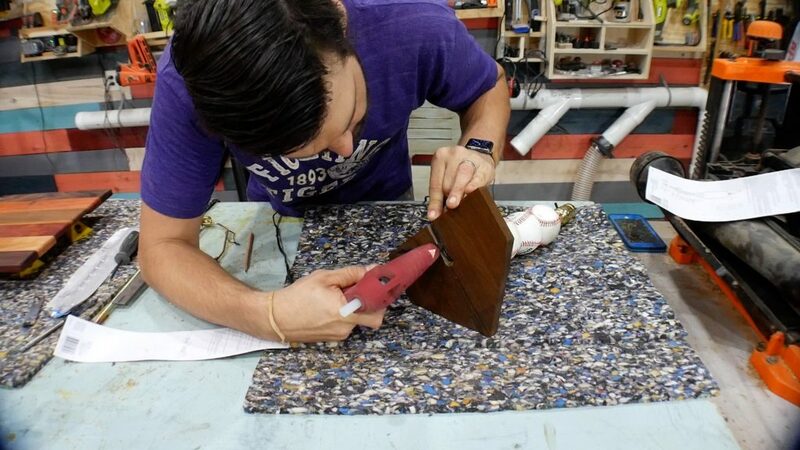 Next, make sure to leave about a half inch of threaded rod on each end so that it will be easy to secure the remaining lamp pieces and it can be attached to the base plate. Also, detailed instructions on how to assemble the different nuts/washers come with the lamp kit. However, I didn’t use some of them b/c the lamp was already secure. Carefully thread the wire through the rod. 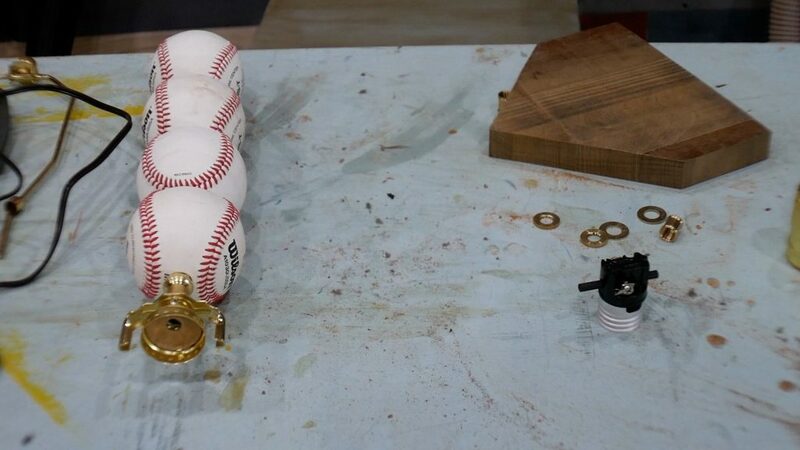 Next, attach the remaining pieces for the DIY baseball lamp kit to one side. 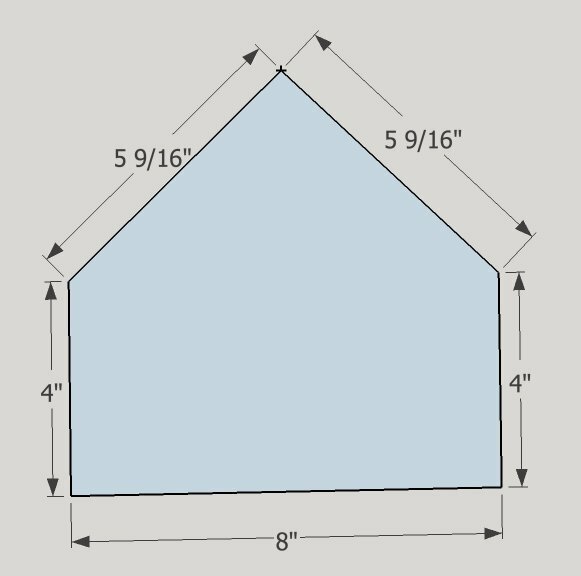 Find the center of the plate using a combination square, speed square, or tape measure and mark the center with a pencil. This is where you will drill the hole for the threaded pipe. Depending on the size of your base, you may want to move the mark 1 or 2 inches back. My homeplate is rather small and having the lamp directly in the center did not look right. Drill a hole using a drill or drill press the same size as the threaded rod, which was 3/8″ in my case. This hole can always be widened later if needed. 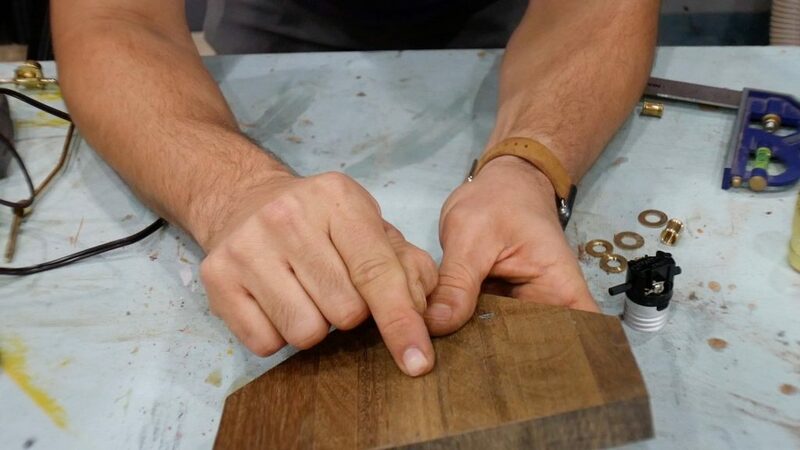 You may want to place a scrap of wood on the underside of the plate to prevent tear out. 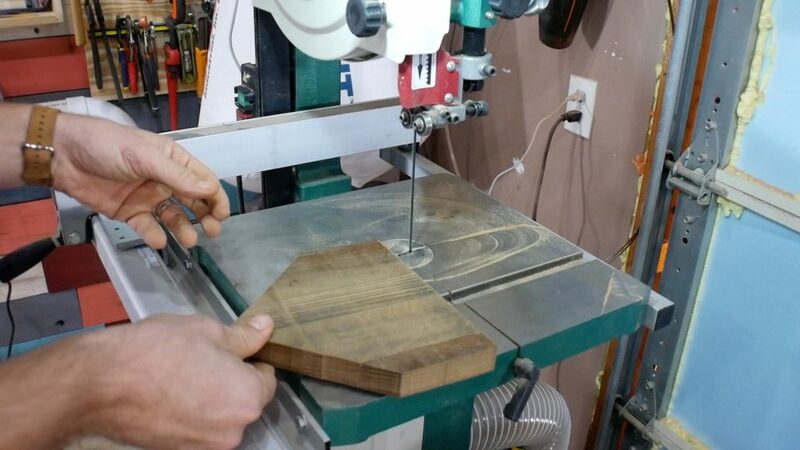 Use a router with a 1/4″ roundover bit on the top edges. 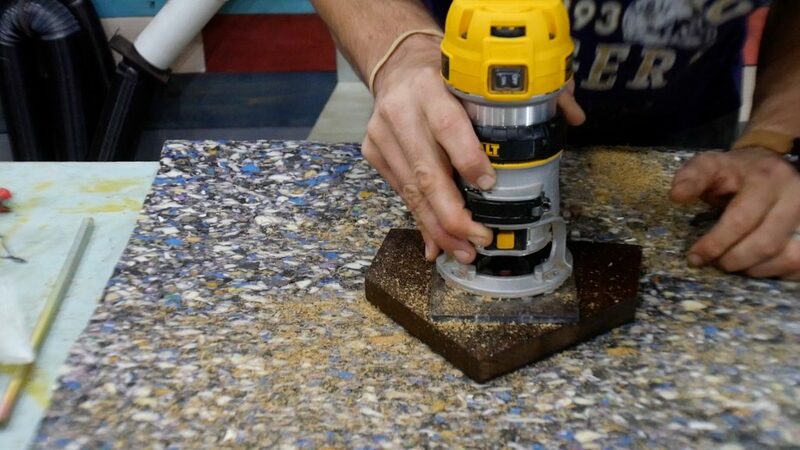 You can also use an orbital sander, or sandpaper to accomplish this as well. 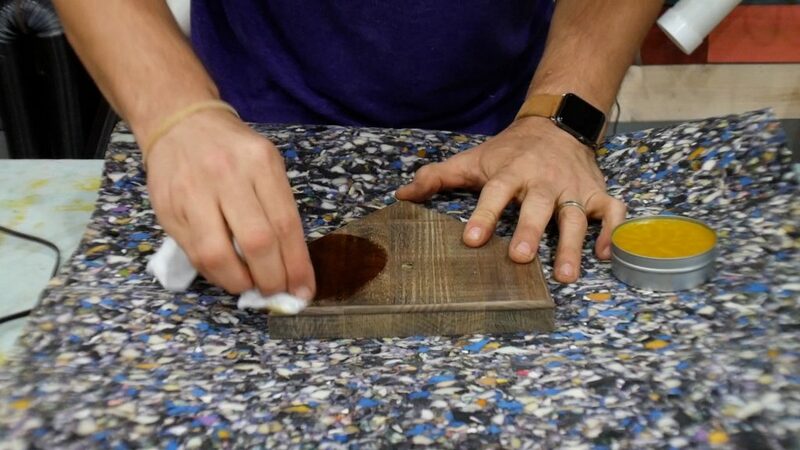 First, sand the entire plate using 80 grit, then 120 grit, then 220 grit sandpaper. This will provide a very smooth surface. Also, skip the 80 grit and 120 grit and go straight to the 220 grit if you are extremely impatient. However, I don’t recommend doing this for many reasons. First, use a damp rag or paper towel to remove the dust from the wood and raise the grain. 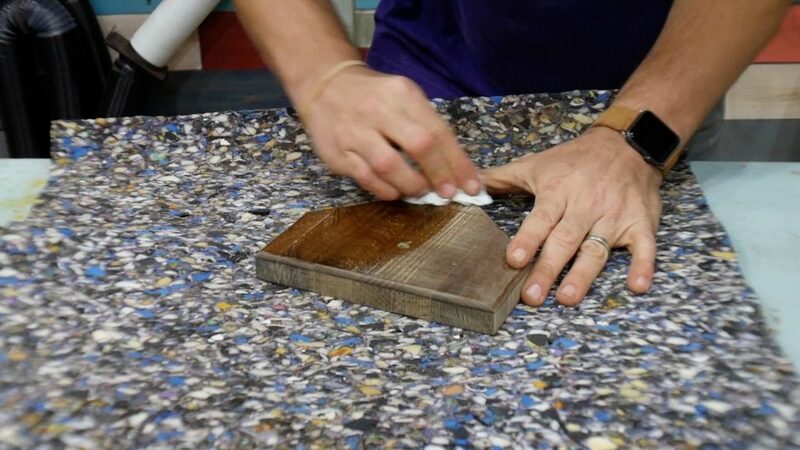 Optional: While the wood is damp, you can quickly sand it again with 220 grit paper. 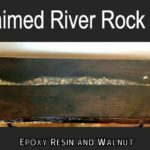 Essentially, this will make a very smooth surface since the dampness in the wood raises the grain. Now, for my favorite part. 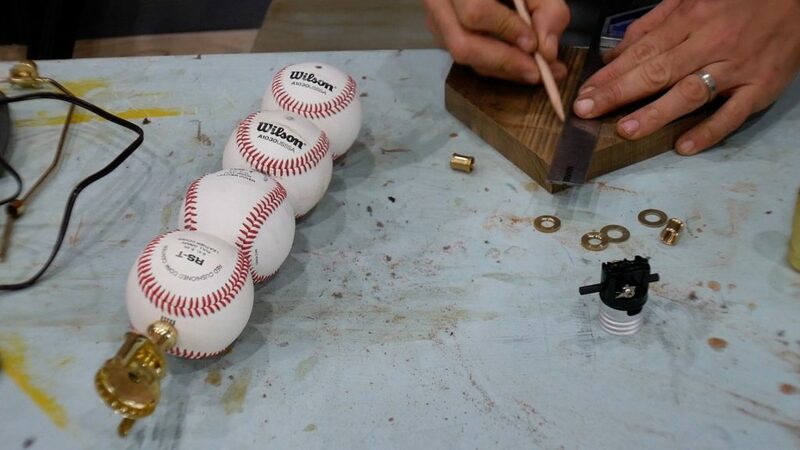 Apply your favorite finish to the wood for the DIY baseball lamp. 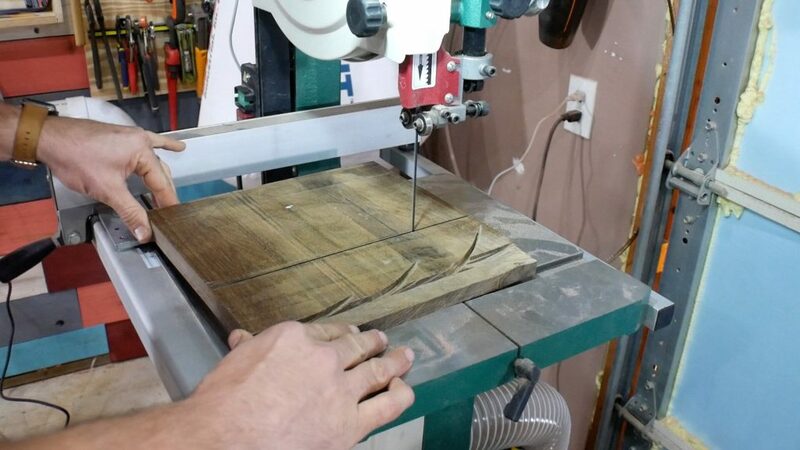 Also, this can be stain, varnish, poly, etc..
First, use a router with a straight bit or v-groove bit to cut a 1/4″ channel on the underside of the plate to the hole. Don’t cut too deep – just wide and deep enough for the lamp cord. Essentially, this provides a channel for the baseball lamp cord to rest in order for the lamp to sit flat on the surface & to hide the cord. Also, I used a v-groove bit set at 1/4″ deep. I kept the line as straight as possible, but didn’t concern myself with it too much because this will be on the underside of the plate. First, pull the excess lamp wire through the hole in the base from the baseball lamp. Next, test the rod to make sure it fits in the hole. 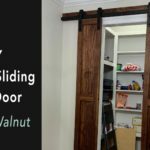 There are a few ways to secure the rod to the plate. Since I used IPE, I was able to simply screw the rod into the 3/8″ hole I drilled. As a result, it fit perfectly. 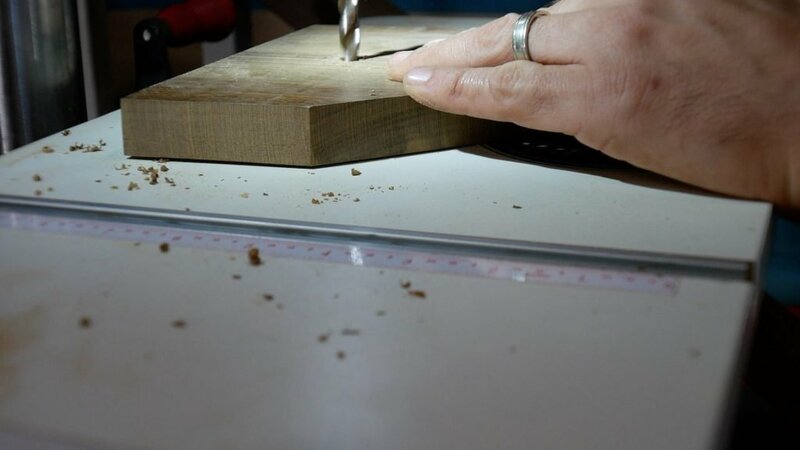 If you are using a softer wood like Pine, you will need to secure the rod to the plate using the provided nuts/washers in the kit. The kit contains detailed instructions on how to do this. 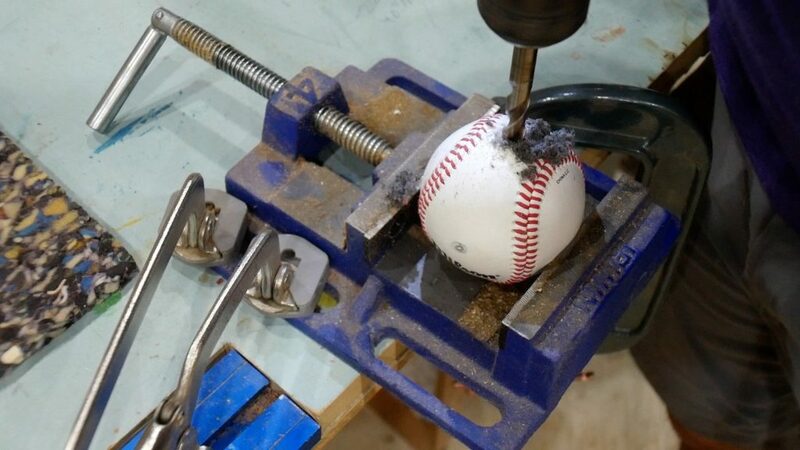 Before proceeding to this step, get a light bulb and test the baseball lamp to make sure it works. Once the rod is secured to the plate & you verified the lamp works, use glue to secure it inside the channel. I recommend you use hot glue b/c it dries fast and can easily be removed if needed to do repairs to the lamp. First, install the remaining baseball lamp hardware for the top of the lamp along with a shade of your choice. I used the lamp shade from the lamp I replaced and it worked fine. 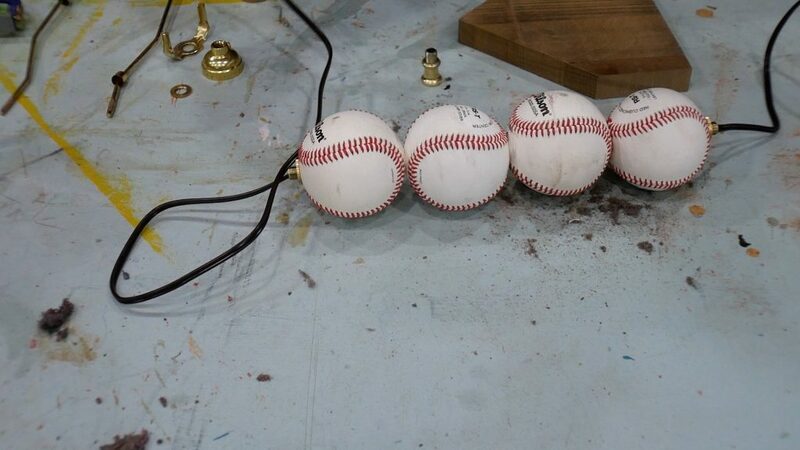 That’s it – this DIY Baseball Lamp project was cheap and took me exactly 40 minutes to make from start to finish. In conclusion, I encourage you to be creative by adding different things to the lamp like a glove on the bottom or as a shade. Be sure to check out my Baseball Bat Display Rack. 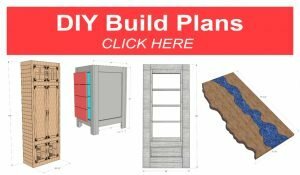 I hope you enjoyed learning more about this project and it inspires you to build your own. 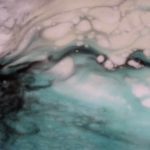 Thank you so much for taking the time to visit my site – I am truly grateful.